Aikido is a Japanese martial art developed by Morihei Ueshiba as a synthesis of his martial studies, philosophy, and religious beliefs. Aikido is often translated as “the Way of unifying (with) life energy” or as “the Way of harmonious spirit.” Ueshiba’s goal was to create an art that practitioners could use to defend themselves while also protecting their attacker from injury. Aikido is performed by blending with the motion of the attacker and redirecting the force of the attack rather than opposing it head-on. This requires very little physical strength, as the aikidōka (aikido practitioner) “leads” the attacker’s momentum using entering and turning movements. The techniques are completed with various throws or joint locks. Ueshiba’s senior students have different approaches to aikido, depending partly on when they studied with him. 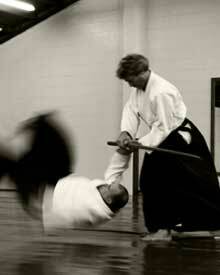 Today aikido is found all over the world in a number of styles, with broad ranges of interpretation and emphasis. 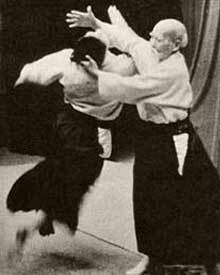 However, they all share techniques learned from Ueshiba and most have concern for the well-being of the attacker. 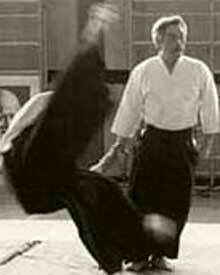 Buikukai is a beautifully dynamic and effective style of Aikido. It is an Osaka-based affiliate Aikikai style, having taken it’s direction from the late Hirokazu Kobayashi Shihan, a student of Morihei Ueshiba. Our head instructor in New Zealand is a student of Hirokazu Kobayashi, Auckland-based Junichi Nishimura Shihan, 6th Dan. 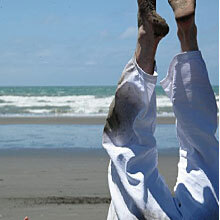 The original Ōtautahi Aikido Group was established in April 1991 under the leadership of Liam O’Donoghue Sensei. We trained at Crichton Cobbers Youth Club in Fitzgerald Ave.
Our founding principles were a technical alignment to the Buikukai style of Junichi Nishimura Shihan, a more democratic approach to club administration and a commitment to respectful and safe training.Founding members included Liam O’Donoghue, Renate Galetzka, Brian Hewson, Dean Glen, Robert Wood & Don Lovett. In 2000, Liam and Renate went to Europe for just over 3 years. During their absence the Ōtautahi Aikido Group was dissolved. In 2004 after returning from Europe, Liam and some former students re-established Ōtautahi Aikido. We are still guided by the original founding principles. 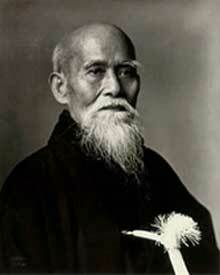 Morihei Ueshiba was born in Tanabe, Wakayama Prefecture, Japan on December 14, 1883. In the earlier years of his teaching, from the 1920s to the mid 1930s, Ueshiba taught the aiki-jūjutsu system he had earned a license in from Takeda Sokaku. As Ueshiba seemed to slowly grow away from Takeda, he began to implement more changes into the art. These changes are reflected in the differing names with which he referred to his art, first as aiki-jūjutsu, then Ueshiba-ryū, Asahi-ryū, aiki budō, and finally aikido. As Ueshiba grew older, more skilled, and more spiritual in his outlook, his art also changed and became softer and more circular. Striking techniques became less important and the formal curriculum became simpler. In his own expression of the art there was a greater emphasis on what is referred to as kokyū-nage, or “breath throws” which are soft and blending, utilizing the opponent’s movement in order to throw them. Many of these techniques are rooted in the aiki-no-jutsu portions of the Daitō-ryū curriculum rather than the more direct jujutsu style joint-locking techniques. In 1927, Ueshiba moved to Tokyo where he founded his first dojo, which still exists today under the name Aikikai Hombu Dojo. Between 1940 and 1942 he made several visits to Manchukuo (Japanese occupied Manchuria) to instruct his martial art. In 1942 he left Tokyo and moved to Iwama in the Ibaraki Prefecture where the term “aikido” was first used as a name for his art. Here he founded the Aiki Shuren Dojo, also known as the Iwama dojo. During all this time he traveled extensively in Japan, particularly in the Kansai region teaching his aikido. In 1969, Morihei Ueshiba became ill. He died suddenly on April 26, 1969 of cancer. Hirokazu Kobayashi was a Japanese aikido teacher and student of the founder of aikido Morihei Ueshiba. In 1970, at the age of 41, he was awarded 8th dan rank. He is the initiator of Buikukai and Kobayashi Aikido styles. Already by the age of 7 years, Kobayashi was studying karate, kendo and judo. 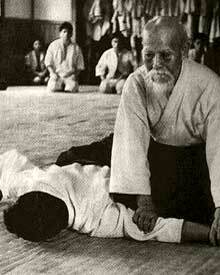 In 1946 his karate teacher gave him a recommendation letter for Morihei Ueshiba. With this letter he went to Tokyo, in order to learn the Japanese martial art aikido. His techniques were described as very short, powerful and precise with as little movement offline as possible. His grabbing techniques consisted of rotating of the wrist producing subtle connection points producing the maximum result with minimal levels of effort. Kobayashi died in August 1998. Junichi Nishimura at 19 years of age entered Osaka Education University where he began practicing Aikido. He trained under Hirokazu Kobayashi and many of his followers. He practiced Aikido in Japan for the following 15 years before finally moving to New Zealand in 1987. Soon after settling into New Zealand he established an Aikido school called Buikukai NZ which now has clubs in both Auckland and Christchurch. Junichi holds the rank of 6th Dan Aikikai. 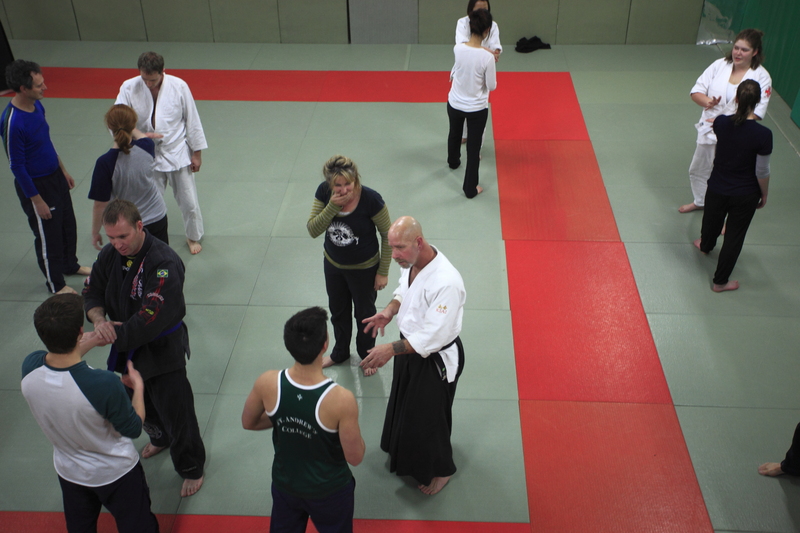 Liam has been training Aikido for around 35 years and teaching regularly for more than 25. He was the founding instructor of the original Ōtautahi Aikido Group, founded in 1991. Liam has trained extensively in Europe, Japan, Australia and Korea. 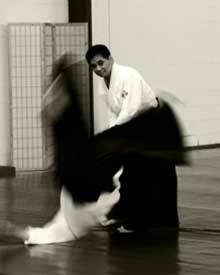 He has wonderful positive energy and inspirational Aikido. Liam holds the rank of 5th Dan Aikikai.